My favorite Nancy Drew Mystery Stories were always the ones in which Nancy leaves River Heights for some more exotic locale. It could be just down the river, like Lilac Inn, or it could be much farther away–like Shadow Ranch or even Hong Kong. 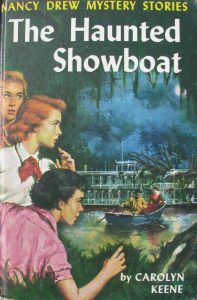 One of stories I liked to read over and over again was The Haunted Showboat. I don’t know what appealed to me so much about that story, but I know much of it had to do with the location. It was set in the South, so the hanging moss and plantation homes were familiar to me. But this South wasn’t like my South. This South was so much larger than life. Perhaps part of the glamour came from the way Carolyn Keene described Nancy’s cross-country trip through a bleak landscape. When Nancy and her chums leave River Heights, it is ten degrees and there is snow on the ground. But after driving several days, they enter a world of blooming azaleas, green grass and relatively balmy sixty-degree weather. It is like Dorothy waking to the Technicolor world of Oz in an otherwise black-and-white film. I realize now, rereading the story as an adult, that the book is a very romanticized version of a South that doesn’t exist any more. And probably never did. In fact, rereading it again as an adult made me cringe in many sections. And I must admit that I would feel funny reading it aloud to my girls. Part of that is because of the awkward dialect and stereotypical characters such Mammy Matilda and Pappy Cole. One of the most jarring lines, however, is actually a throwaway phrase in a description of the area. Soon they were in an area of lovely Southern plantations. They were thrilled by glimpses of the homes, so large and stately with their tall columned porches and beautiful gardens. Quaint cabins, formerly used by slaves, stood some distance away from the houses. Quaint cabins, formerly used by slaves. Yet Nancy brazenly drives around in her convertible. She is a strong, capable woman who champions the underdog, helps the helpless, and is determined to always do the right thing. If she does that in matters as small as refusing to cheat at golf, I’m sure she would tackle today’s social issues in a way that would be just as righteous and dogged. Perhaps she would even be a patron of the Slave Dwelling Project.